After his arrival to Scotland and marriage to my mother, dad frequently took part in the Drama Group at the Anderson Church Hall, Stonefield Road. The building today is now the funeral home next to the Bowline Club. I often recall him playing the guitar or banjo, and indeed it’s one of my earliest memories. As clear as day, i can recall as a toddler sitting in amazement watching him alone on stage singing “country roads” in his broken English accent. I couldn’t have been more than 3 years old. Slightly earlier, this newspaper extract from 1972 shows the Anderson Drama Group, my dad Josef Veverka on the left. Pictured also is Irene Dye, Anne Reid, Archie Duncan and Ronnie MacFarlane , although i’m not sure who the others are. The drama group often put on entertainment and shows for the congregation of Anderson Church. Another relevant photo i have is this one. 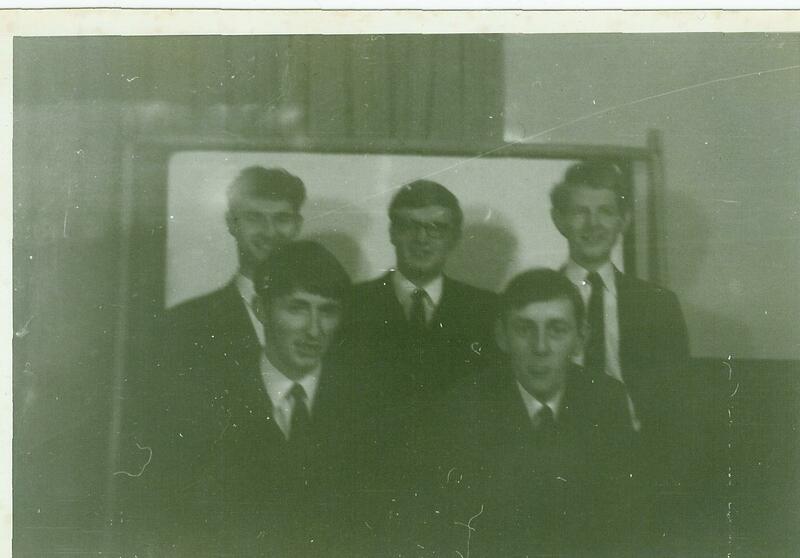 I know it relates to the Anderson Church Drama Group and is dated at 1968. At the left back is Archie Duncan, my uncle. At the right back is Ian Proudfoot and on the front is Kenneth Crombie. However, i don’t know the identity of the other two men, who would surely have been local to Stonefield. If you know any of the missing names in these photos, please let me know. Jim Reid Ronnie Mc Farlanr, Annette Robson?? Valerie Krawczyk Is that William Robson as well? Amanda Louise Barlow Lol nice hair Ann!!! Amanda Louise Barlow Ann Reid looking good! Jayne Baker Ann Reid looking pretty cool!! Emily Rorke Aww, we had great times there with John Clyde in badminton group in 70s. And I remember William Robson looking like this. Mary Brown, memories!